Theron “Ted” Rose of Woburn, November 14th, at the age of 79. Beloved husband of Barbara (Nohelty) Rose. Loving father of Ronald Rose and Stephen Rose, his late wife Joanne, both of Woburn and the late John Rose. Loving grandfather of Natalie of Medford, and Jake Rose of Nashua NH. Dear brother of Jean Fournier, John Rose, his wife Alice of Woburn, William “Taylor” Rose, his wife Alice of Woburn and the late Alice Malone, Mary Manilla, Walter, Richard and Barbara Rose. He will also be missed by many loving nieces, nephews, cousins, and friends. His Funeral Mass will be held Tuesday, November 20th at 10 a.m. in St. Charles Church, 280 Main Street, Woburn. Those attending are invited to meet directly at the church. Interment will take place at the convenience of the family. Relatives and friends are invited to call from 3-7 p.m. Monday, at the Lynch Cantillon Funeral Home 263 Main Street, Woburn. At the families request, in lieu of flowers, remembrances in Ted’s memory may be made to Cambridge Family and Children’s Services, 60 Gore St, Cambridge, MA, 02141. For directions or to leave an online condolence, please visit www.lynch-cantillon.com or Facebook under Lynch-Cantillon Funeral Home. 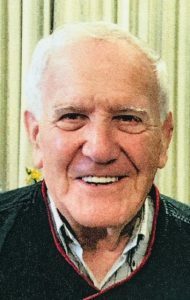 Theron “Ted” Rose passed away at his home suddenly Wednesday morning, November 14th, 2018. The beloved husband of Barbara A. (Nohelty) Rose he was seventy nine years of age. Born in Lexington, Ted was one of nine children born to the late John and Dorothy (Murray) Rose. Raised there until Junior High, his family moved to Woburn where Ted attended Woburn Public Schools and graduated from Woburn High School with the Class of 1957. Ted began working for UPS then to Carolina Freight and a member of Local 25, from which he retired. The brought three sons into the world and had made their home in the east Woburn section of the city . Ted was extremely active in the lives of his children. He coached, Popwarner football, youth hockey, girls softball, for the city and was also very active at the Woburn Boys and Girls Club in many different capacities. They visited many sporting arena’s across the country; visiting with Pete Rose in Cincinatti, Baseball Hall of Fame along with the different ball parks and anything else relative to sports! For over twenty four years he has been a season ticket holder of the Boston University Terriers. This was a time that the family would all go together, again enjoying the camaraderie of family and sports, and a wonderful meal was enjoyed before or after the game! For over thirty years Ted brought much joy to the children of many different friends and organizations, as Santa, with his belly laugh baring gifts for all; the Easter Bunny to brighten children’s days. For over twenty five years Ted has worked with the Special Needs population. Riverside Family Services, Cambridge Family and Children Services, NuPath, both as a driver and helper. Ted would swing by his clients homes, pick them up, bring them to wherever they needed to go and would later be dropping them off . He loved this experience! He was dedicated to each and every one of his clients and thoroughly enjoying each and every day for over twenty five years . Ted was truly a very unique individual. There was not a thing he wouldn’t do for anyone he came across. He wrote children’s books, had made a CD of songs that he wrote, he was never afraid to attempt something out of the ordinary..
A very kind, thoughtful, generous man, no matter what he did, a very special touch was added by Ted to everything he did! Ted’s faith and his family, filled his heart and his life, in all that he did for them and for others. Sadly just two short months ago Ted was preceeded in death by his son John. He was also predeceased by his parents and siblings, Alice Malone, Mary Manilla, Walter, Richard, and Barbara Rose. Ted is lovingly survived by his dear wife of fifty eight years, Barbara (Nohelty) Rose. Loving father of Ronald Rose and Stephen Rose, his late wife Joanne, both of Woburn and the late John Rose. Loving grandfather of Natalie of Medford, and Jake Rose of Nashua NH. Dear brother of Jean Fournier, John Rose, his wife Alice of Woburn, William “Taylor” Rose, his wife Alice of Woburn. Ted will be missed by many loving nieces, nephews, cousins, and friends. His Funeral Mass will be held Tuesday, November 20th at 10 a.m. in St. Charles Church, 280 Main Street, Woburn. Those attending are invited to meet directly at the church. Interment will take place at the convenience of the family. Relatives and friends are invited to call from 3-7 p.m. Monday, at the Lynch Cantillon Funeral Home 263 Main Street, Woburn. At the families request, in lieu of flowers, remembrances in Ted’s memory may be made to Cambridge Family and Children’s Services, 60 Gore St, Cambridge, MA, 02141. For directions or to leave an online condolence, please visit www.lynch-cantillon.com or Facebook under Lynch-Cantillon Funeral Home. His Funeral Mass will be held Tuesday, November 20th at 10 a.m. in St. Charles Church, 280 Main Street, Woburn. Those attending are invited to meet directly at the church. Interment will take place at the convenience of the family. Relatives and friends are invited to call from 3-7 p.m. Monday, at the Lynch Cantillon Funeral Home 263 Main Street, Woburn. At the families request, in lieu of flowers, remembrances in Ted’s memory may be made to Cambridge Family and Children’s Services, 60 Gore St, Cambridge, MA, 02141. For directions or to leave an online condolence, please visit www.lynch-cantillon.com or Facebook under Lynch-Cantillon Funeral Home. On behalf of the Board of Directors at Cambridge Family and Children’s Service, I want to extend our deepest sympathy and tell you how much Ted was appreciated and loved at CFCS. His presence brightened so many lives. I am glad we got to celebrate his time with us at the annual meeting this fall, something he richly deserved. He will be missed. I wasn’t as close to Ted and his family as the other contributors here but he coached both of my daughters back in the day and we have been friends since then. We had a standing joke that I was preparing a petition to get him fired and every time I saw him at Jacks we’d have a good laugh about it. Woburn has lost a great guy, friendly and always helpful when needed. Rest in peace, buddy. Ted was such a nice man, a gentleman, and his smile was contagious. He will be missed. Peace to you in the days ahead. Ted was always so welcoming to the Xaverian students who did service work at the Fernald School many years ago. Ted’s compassion for and a sense of humor with adults in need was an excellent example for others to see. I am sorry to hear about this loss. I was so saddened to learn of Ted’s passing. He was a very special man who brought a smile to everyone’s face. I especially remember when he played Santa to my children at my sister Nancy’s house. He was so impressive & kind. I was sad to learn of Ted’s passing. He was truly one of a kind and will be sorely missed by many. He was my favorite coach ever (apologies to Franny, Peter, Tom J., Tom M., Frank, and Ed). I still have lots of GREAT memories of playing hockey on teams that he coached (especially the trips to Canada!). I still remember his sage advice – ‘Don’t dwell on the negative’. The City of Woburn and countless children throughout the area are better off today because Ted was in their lives. I hope you all can take some solace in the fact that he was a true legend to many and a hero to lots of the most special members of our society. Woburn lost a special hero! Ted’s smile was always contagious & uplifting. Politicaly: he had his views & it was always to help people who couldn’t take care of them self. He did more for mentally challenged people then anyone..The Heart of gold. Loved his Sports any & all. Heaven got a wonderful person who will be dearly missed by ALL! Think it was 1949 when Theron & the Rose family moved to Woburn from Lexington. We became classmates & buddies. Altho we remained buddies, alas our encounters became less frequent as the years rolled on. RIP buddy. I think the year was i950. Theron & the Rose family moved to Woburn from Lexington. We quickly became classmates & friends, Have remained friends since then . I’m regretful that we’ve drifted the last few years. Best luck in Nashville w/ the book !! My big brother, John Parrish, absolutely adored Theron — as you remember, and the friendship they shared endured throughout the years. I remember, as a little girl, the many times Theron came to our house on Cambridge Road and shared a meal with us, or just came over to hang out and listen to music. Our whole family thought the world of him. It was my good fortune two years ago to have lunch with Theron and with Ronnie (Bo) Stander and to reminisce on those years long past, and the wonderful life he felt blessed to have. It was a memory I will cherish, along with his c.d. of his songs that he mailed. He touched so many lives and was such a very good man. On behalf of all the Parrish family, sincere sympathy on your loss. Dear Barbara, Sorry to hear of Therons passing. Theron was a real nice guy. A real original in the best sence of the word. So sorry for your loss. My heart, prayers and thoughts go to all of you at this difficult time. I was blessed to be able to work with Ted and see him every few weeks as he dropped off his papers at the office. His stories about his life, his love for his amazing, loving wife and how proud he was of his boys are what I will treasure the most about him. I looked forward to seeing him and catching up. He brightened everyone’s day when he was at the front desk with me and he was truly treated as he would say a “Rock Star” because he was so many things to so many people. If you were walking by when Ted was here you stopped and said Hi that is how special and loved he was by all of us. He also believed and our cause and fought along side for the rights for so many. We have lost a very special man who was an Angel for all he gave to his clients and their families. He has made me see things differently and I know that he is smiling down on all of you and will always be there when you need him. Ted will be always remembered by all of us here and be missed dearly. Paul and I are so sorry about Ted. He was a special person and a wonderful santa. So many fun memories. Barbara, Eric and I extend our most heartfelt condolences to you and your family. I’ve known, worked with and admired Ted for over 30 years. He was a special man with the greatest capacity for compassion and generosity. And he spoke of you, his bride, often and with such love. You were his sweetheart. Ted and I often spoke about our sense of family along with Fran and others from the Activity Center which Ted enjoyed, helped out at specoal events and was a frequent visitor. You have always been and will continue to be a member of this family. Our thought and prayers are with you and our arms around you. The world is indeed a better place for having had Ted in it and he will be sorely missed. I am so deeply sorry for your loss of your beloved husband and father. I also meant to send my condolences for John as well. It is truly been a terrible year for your family. Although I have not seen your family in over 40 years when I left the neighborhood, I remember growing up on Dewey Ave when all the kids would play together. I remember playing in your backyard with Johnny and Ronnie. If my memory serves me correctly, I remember walking around the neighborhood with the kids singing Christmas carols and getting hot chocolate at your house. Theron was such a kind and gentle man in my memory. It’s very hard to lose a loved one and you try to hold onto those memories. I wish your family peace during this difficult difficult time. My thoughts are with you.